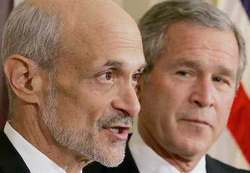 Seven Days Blogs: Freyne Land: Here comes Chertoff? According to a reliable source, Secretary of Homeland Security Michael Chertoff is coming to Vermont on Wednesday for a quickie visit to the law enforcement support center in Williston. The topic, we're told, is a proposed "enhanced driver's license" that will allow travel back-and-forth to Canada without requiring a passport. Gov. Jim Douglas will be his host. We noticed that the Guv's public schedule for Wednesday was blank. Perfectly understandable that the Fifth Floor would not want to publicize the Secretary of Homeland Security's visit. Hey, it's not George "WMD" Bush himself, but....close, eh? Sources tells us Sec. Chertoff's official Vermont visit is scheduled for 2 p.m. Wednesday afternoon at the Law Enforcement Support Center on Harvest Lane in Williston. That's about a mile west of Tafts Corners. Speculation is all the hush-hush [still no response from Douglas Press Secretary Jason Gibbs to our phone and email inquiries], is to keep the anti-Bush protester-turnout to a minimum. I was going to Google Harvest Lane , Williston and then thought twice about it. America the land of the free. Thanks Patriot Act. Do it the old fashion way and break out a map. Or, just take the road directly across from Blair park, the LESC is the big unmarked building with security guards out from supplement with secret service. Maybe you should stop by and tell them how you feel about GW.